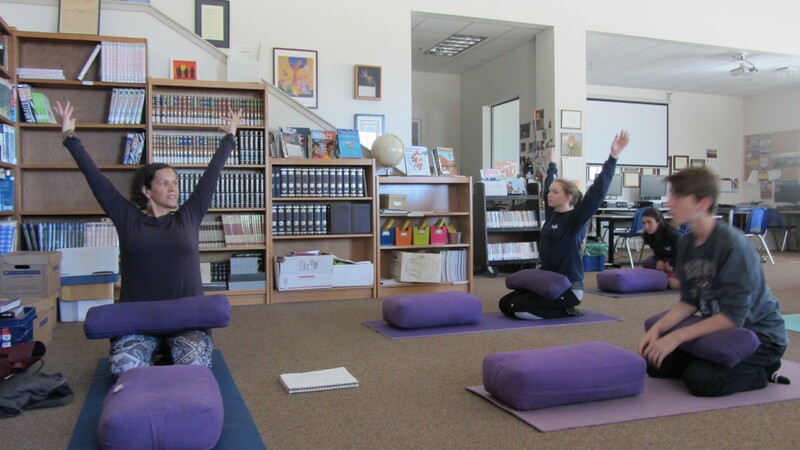 Asanas, or yoga poses – for strengthening body and mind, easing tension, and focusing breathing – are a healthful practice for students at Mount Madonna School (MMS) to incorporate into their school days. Three times a week, MMS sixth, seventh and eighth grade students spend 15 minutes warming up their minds and bodies with an asana program led by yoga teacher Jess Westbrook and other faculty. 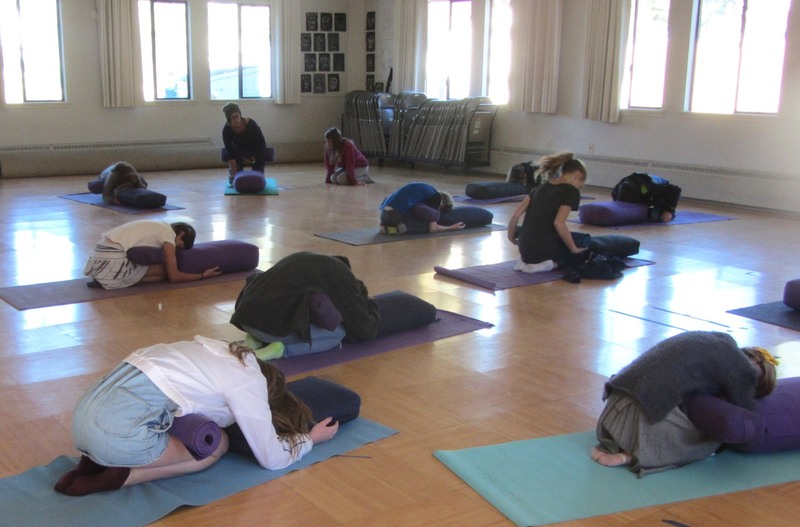 Students gather in a softly-lit assembly room, placing yoga mats and bolster pillow “props” around the room. Voices are low, speech and movement, calm and focused. On a recent morning, several students chose to warm up with gentle stretches as their classmates got settled and Westbrook began to guide the students’ in their first pose. 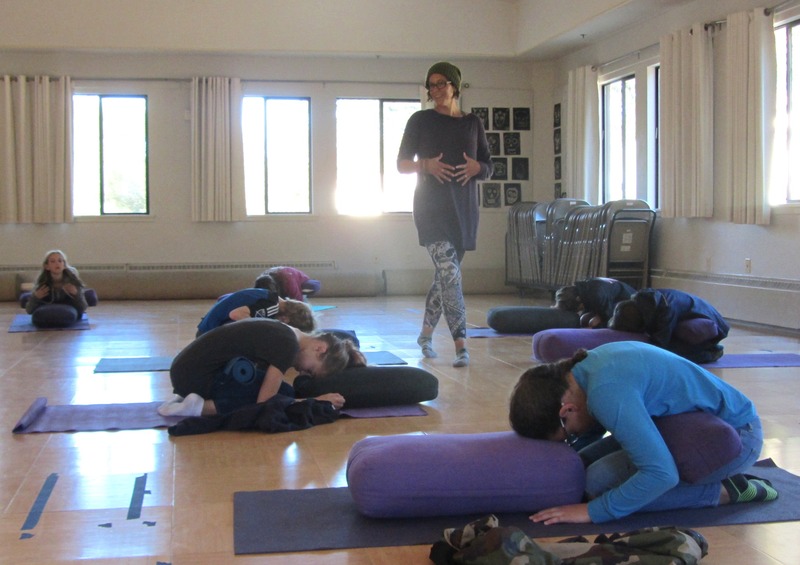 This is Westbrook’s first time teaching a yoga asana practice, although she has taught meditation and pranayama, a form of ashtanga yoga involving breathing exercises, to children and adults for more than six years. In addition to this practice with middle school students, Westbrook, a parent of three MMS students, teaches weekly elective yoga classes to ninth, tenth and eleventh grade students. 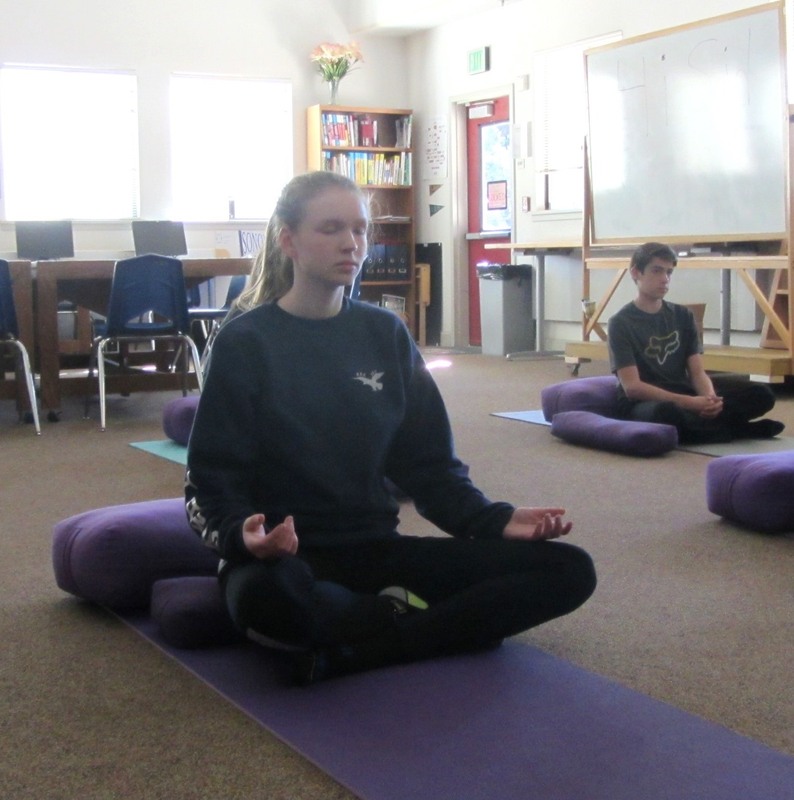 For the second semester, most twelfth grades students are taking a yoga elective course she is offering focusing on stress relief, self-reflection and flexibility. Westbrook holds a B.A. in psychology/law and society from Oberlin College. She has worked as a behavior modification specialist and resource specialist aid for middle school students with the Mountain View School District. She is also an experienced massage therapist focusing on clinical deep tissue and sports therapy. Westbrook brings her knowledge of anatomy/physiology, kinesiology and injury prevention to her classroom practice. While raising her family, Westbrook “dove into yoga study” and support of developmentally based education with a focus on positive discipline (as espoused by Jane Nelson). Before attending Mount Madonna School, her children attended a Bay Area parent-participation elementary school based in positive discipline that required certification in understanding and using Jane Nelson’s model to encourage strong social and emotional development beyond simple child development (lots of conflict resolution/ nonviolent communication). “Within my own life yoga has been the most all-encompassing positive transformative practice I have ever done,” reflected Westbrook. “Mount Madonna Institute teacher Om Anand explained it beautifully one morning, and I paraphrase, ‘While my occupation is [fill in the blank], the greatest preoccupation of my life is yoga.’ I completely agree as I look back at how my daily yoga practices have changed my life in the 11 years I have dedicated to them. I truly love teaching yoga at MMS, in this way, with these age groups. Yoga and Ayurveda have so much to offer with a multitude of practices for most any person. There is nothing cookie-cutter about yoga beyond bringing awareness to the breath, the body, and calming the mind. Over time Westbrook furthered her studies and gained several certifications: as a meditation, spiritual direction, Vedic counseling, ayurvedic home remedies, scriptural study, and Kriya yoga. 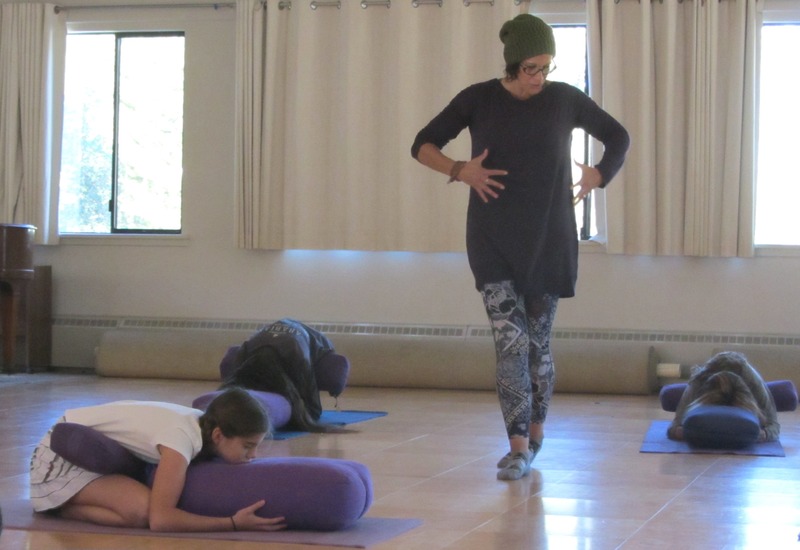 Through studies at Mount Madonna Center, she completed 200 hours of yoga teacher training, and is in progress of earning an ayurvedic health counselor degree. “I have volunteered at all of my children’s’ schools,” commented Westbrook, “and have always had a great love of working with children in most any capacity, doing my best to offer a safe environment for expression, listening to their challenges, accepting them completely as they are and offering guidance if asked. Seventh grader Cooper Padilla acknowledged that while he isn’t particularly fond of the yoga practice, he’s experienced some positive benefits. Cooper’s mom, Amy Padilla, said she is a big fan of yoga and strongly supports MMS incorporating the practice into its curriculum. She said she’s noticed her son practicing yoga breathing before bed sometimes, and feels it’s a helpful practice for calming oneself before sleeping. Middle school is a large, lively and diverse group. For each yoga course there are two teachers, so students can choose between outdoor mindfulness walking meditation or indoor asana practice with savasana, a pose of total relaxation – making it one of the most challenging poses. At the onset of the school year, each of the high school classes quickly became a yoga-focused study group, Westbrook said, because students were able to choose to take this elective course. “As students set up their mats and props, we do a check in about stress, sleep, concerns, injuries, wishes, and avoidance for the practice that day,” she explained. “We warm up, follow a sequence of hatha yoga poses to apex poses, cool down to savasana with breath awareness. As the class opens, I discuss weather or season effects on the body and mind. I make observations on the ‘feel’ of the room and what I notice about the students and what may need support, and they agree or disagree. Junior Maverick Bettencourt said he tried yoga once or twice before as a freshman, but did not maintain a regular practice. Now, a couple years later, he said he practices the yoga nidra or yogic sleep meditation, on a regular basis and has found it reduces stress and helps him rest. Westbrook encourages students’ open questioning of the practices – the “why – of what the class focuses on, as well as encouraging sharing about discomfort, injury or challenges related to the practice. 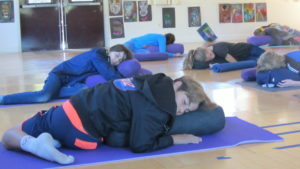 “I want students to develop an awareness, if not a deep experiential awareness, of the connection between body, breath and mind as a tool for stress reduction. Through practice and experience, students can see benefits of lower stress, improved sleep, improved immune function and deepened concentration by using the practices shared in class in their own time and asking for feedback.